What’s the difference between Homeowners Insurance and an HSA Home Warranty? Homeowners Insurance and an HSA Home Warranty: What’s the difference? and general liability that can arise when a person is injured while on your property. Your air conditioning starts blowing warm air. The thermocouple goes out on your water heater, and there’s no hot water in the house. You turn on the shower, but only a trickle of water comes out of the faucet head. Your oven won’t reach pre-set temperatures. Your garbage disposal won’t grind. Your electrical panel is blowing fuses regularly or not operating properly. While these seven situations probably wouldn’t be covered under most homeowners insurance plans, they likely would be covered under an HSA Home Warranty, assuming the problems were because of wear and tear, age, or another circumstance covered under the terms of the home warranty agreement. 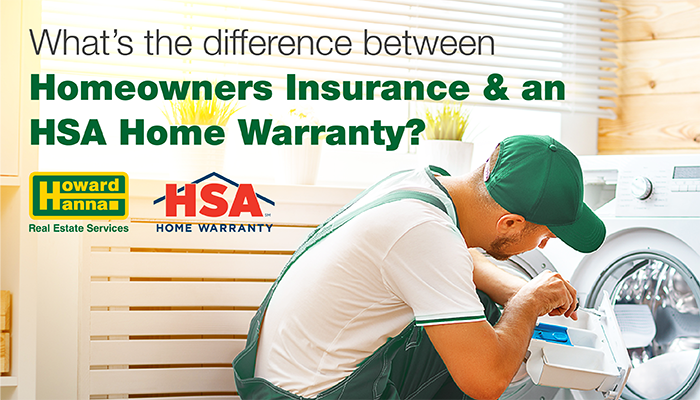 The HSA home warranty is a service contract that provides for the repair or replacement of your system components and appliances that fail due to age and normal wear and tear. An HSA Home Warranty is the perfect complement to your existing homeowners insurance. With both an HSA Home Warranty and homeowners insurance, you can give your home and your budget the best security and coverage while minimizing worry and stress for yourself. At Howard Hanna Real Estate Services, our goal is to give you the best coverage and help you make Home Happen Here. With our one-stop shopping, we offer real estate services, mortgage services, title and escrow services, and insurance services, taking the worry out of homeownership by guiding you through your entire home buying or selling experience. In addition, our partnership with HSA Home Warranty helps us provide you with the peace of mind that your home is protected, from top to bottom.